Hammerhead #1 cover art by Francisco Francavilla. When you think of James Bond, there’s two different facets that come to mind: the charming, handsome gentleman-spy, and the brutally efficient man of action. Reconciling those two sides of 007 are crucial to any great Bond story—but for writer Andy Diggle, they’re especially important for his upcoming comic miniseries Hammerhead. Spinning out of Warren Ellis’ excellent Dynamite Comics series, Hammerhead sees Bond facing a moral dilemma of his own when he goes on the hunt for Kraken, an anti-capitalist force who’s got plans for Britain’s nuclear arsenal. But when Bond learns of a far more nefarious threat closer to home, can he trust the country he’s sworn loyalty to? Can he be the killer they need him to be, in an era when the lines between ally and enemy are blurrier than ever? Hammerhead #1 cover art by Ron Salas. We spoke to Diggle about his approach to writing Bond, and what makes the character so compelling over 60 years since he first appeared, and you can read the whole interview below—alongside some unlettered pages from the first issue of Hammerhead, making their debut here on io9. io9: How did you get involved with writing this series? Andy Diggle: Nick Barrucci at Dynamite had initially approached me back in 2014. I was flattered, but had too much going on at the time. Fortunately he was happy to wait ‘til my schedule cleared up a little, and I’m grateful that he did. I’m having a blast! Is there a particular version of Bond that has a special place in your heart? Diggle: It has to be Connery, doesn’t it? Inimitable charisma. And while it can be helpful to see—or more importantly, hear—an actor in your mind when you’re writing, you don’t want that to make it to the finished comic page. The comic has to be its own thing. And of course we’re drawing inspiration more from Ian Fleming’s original character than from the various screen incarnations. Tell us a little bit about the setup for Hammerhead. Diggle: It begins with Bond assigned to hunt down “Kraken,” a radical anti-capitalist who has targeted the defense contractor replacing Britain’s aging Trident nukes. Needless to say, things get a little more complicated. The wider story is about Britain’s place in the post-Cold War, post-Brexit world. Are we still a global power? Do we even need nuclear weapons? Is 007 a force for positive change, or a protector of vested interests? Hammerhead is the name of a high-tech weapons system Britain is selling to allies with less-than-stellar human rights records. The question is, do the ends justify the means? The Cold War made that kind of moral evaluation much simpler—the Soviet Union and SMERSH were the enemy. Nowadays, Bond has to navigate a moral maze where even allies spy on each other. How did you approach taking Warren Ellis’ interpretation of Bond and making it into your own for Hammerhead? Diggle: The character is bigger than any one writer, and I’m not trying to mimic anyone’s style. This is my Bond. Detached, professional, ironic. A man who doesn’t particularly enjoy the dirty work, but puts his life on the line because it because he believes in the greater good. Of course, it isn’t always easy to see which way the greater good lies, and I think Bond is somewhat fatalistic about that. You play the hand you’re dealt. Were there any particular elements from Fleming’s work that you wanted to draw upon for Hammerhead, or any challenges you wanted to tackle in bringing Bond to life? Diggle: Fleming’s Bond is a sophisticate, educated at elite institutions like Eton and Fettes, and unashamedly enjoys the finer things in life. It’s tricky, because I’m not sure how well a 100% book-faithful version would work in monthly comics. Fleming might devote a whole section to describing a meal, or a game of cards or golf, but that wouldn’t work so well in a 22-page comic. It’s a visual medium, stories told in monthly chapters, so readers have reason to expect a certain amount of bang for their buck. My job is to strike the right balance between keeping the story cracking along while still allowing Bond to be Bond, giving him room to breathe. We’ve chosen not to give him an interior monologue, so we’re not privy to his moral and philosophical musings the way we are in the novels. So you have to imply what’s going on in Bond’s head through action and gesture and facial expression alone - brought to life in Luca Casalanguida’s wonderfully expressive artwork - and let the readers fill in the blanks themselves. That’s one of comics greatest assets, by the way - that participatory relationship with the reader. So to answer your question, one of the things I’d like to salvage from the novels is a glimpse of Bond’s moral center. That part of him that feels outrage at the murder of innocents, and drives him to risk his life to punish those responsible. He isn’t just following orders. It’s almost too easy to focus on Bond as a cold-hearted killer but lose sight of the fact that he regularly puts his life on the line for the greater good. So is he a hero or an assassin? The answer, of course, is both. What do you think it is about this particular version of the character that makes him stand out from past interpretations? Diggle: I think that’s for other people to judge. I’m not trying to make him different just for the sake of being different. I’m just writing the James Bond that feels right to me. What’s that process of working with Luca Casalanguida been like? Diggle: I’m very happy to be working with Luca. I first became aware of his work last year when he sent me some wonderfully noir Batman sample pages. I was impressed, and jumped at the chance to bring him on board for Bond. He has a very fluid, European style which I think is a great fit for the character, and I love the shadowy, chiaroscuro feel; heavy black ink. It feels like a comic book, in the best way. As a writer who’s now adding stories to the wider Bond universe, what do you think it is about the character that makes him so appealing today, all these years after he first appeared? Diggle: There’s always been a large measure of masculine wish-fulfillment to the character, and I think you have to embrace that without being regressive. Like all true icons, Bond is reinvented for each new generation, while still remaining true to the core of the original character. It’s about striking a balance. To an extent he can be an even more compelling character in the present day than he was during the Cold War. We live in a confusing, fast-paced world of shifting allegiances and moral compromises; it can feel overwhelming. But James Bond cuts through all that with clear-eyed decisiveness. He knows the stakes, he knows what he has to do, and he knows what’s getting in his way. There’s an unashamed pleasure in sitting back and watching him do his thing. I’m having a lot of fun contrasting Bond the well-spoken gentleman with Bond the ruthless man of action. I think that contrast lies at the core of his appeal. 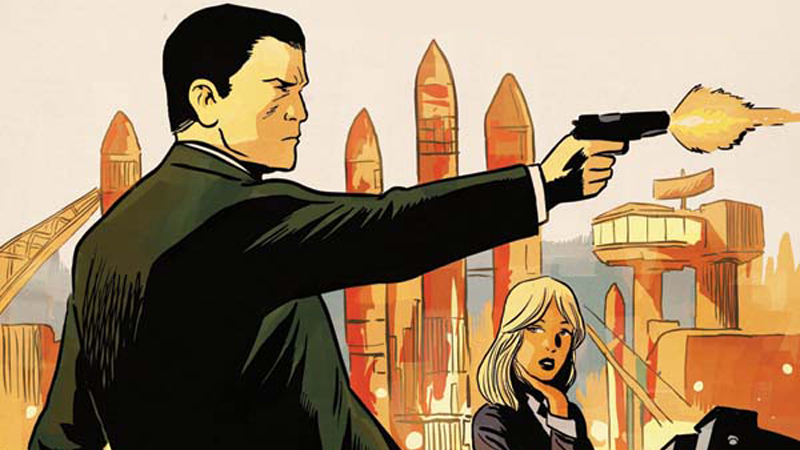 James Bond 007: Hammerhead #1 hits shelves this October.